Getting about with more than one child brings a whole new set of challenges. Even getting up and down stairs is a tricky proposition. 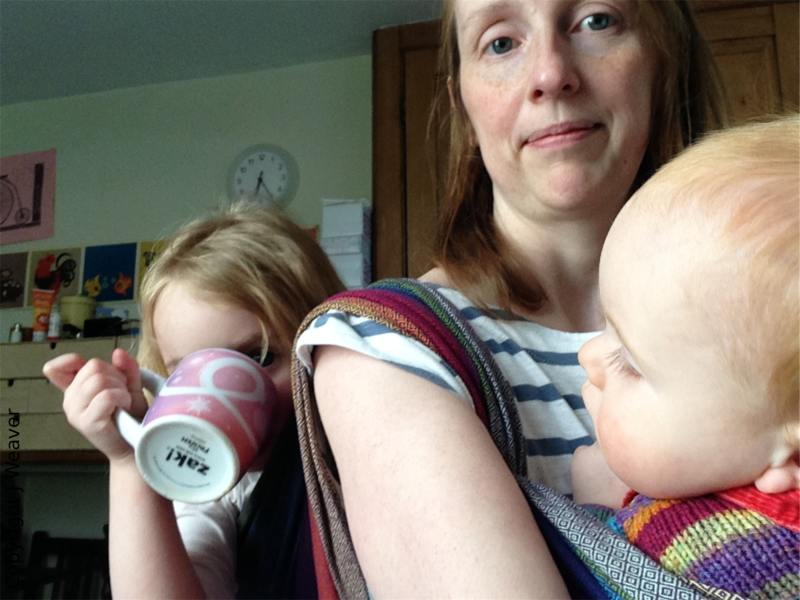 Carrying one or more children in a sling can be a great help in daily life. 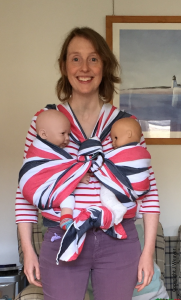 Library consultants can help families to find slings of combinations of slings which work for them and work with families to build the skill base and confidence necessary to carry twins or children close in age in many situations. Tandem carrying with one child in front and one behind. If you are planning on visiting the library for advice on carrying twins or siblings, please give us some advanced notice so that we can have a think about your particular situation and have some options prepared in advance… Sometimes even sling consultants need a little practice! The Library stocks and can advise on suitable stretchy wraps (more structure a can be helpful for carrying more than one child), ring slings, scootababy, woven wraps and buckled carriers and for babies from around 4-6 months and upward (depending on the children’s development) have a Twingo Carrier. The Twingo is designed to provide a family with a carrier that can be worn either as two separate slings or as one combined sling which overcomes possible clashes of limbs and buckles.